There are many fans of Singapore Telecom plays M1, Singtel and Starhub and are pretty obsessed watching their share prices and their yields. Perhaps they are best served spending time watching some telecom stocks that you can obtain overseas. In Hong Kong you have mainly HKT Trust, Hutchinson Telecoms and Smartone. Hutchinson Telecom is a balanced wired + wireless telecom operator. It currently yields less than 4%. Smartone is a full wireless operator. The attractiveness of Smartone is that its EV/EBITDA is less than 6 times while having a dividend yield of 7% with zero debt. This evening HKT Trust announced its half yearly results. Results look fair without much surprises. I tend to be more interested in HKT Trust due to its extensive broadband operations. If we talk about economic moat, I find the advantage of a dominant fixed line operator to be more wide, due to the direction of technology in telecommunication space. Hong Kong is dense and like Singapore will keep capex to a certain manageable level. HKT have just completed capex to deploy Fibre to the home (FTTH) to 80% of Hong Kong. Hong Kong have the fastest tested fibre speed in the world. Their mobile market share is only 11%. This is where the growth area is. PCCW/HKT is the only telecom operator in HK capable of providing Quad Play Bundling. They do derive a chunk of their revenue from fixed phone lines, but are innovative to introduce a hybrid VOIP Android solution with subscription to their customer. In the latest report, this segment have stagnate. There are businesses and residential that will still prefer fixed line but we do expect this segment to weaken. Hong Kong have 5 telecom. Singapore have 3 telecom. Tells you enough how competitive it is over there. From the looks for it, HKT Trust will build up and distribute HKD 0.46 for the full year. At a share price of HKD 7.81, yield have rose to 5.9%. I have a sense after talking so much people will be more interested in Smartone haha. In the book The Outsiders, one of the profiled leader that is being said as a great capital allocator was John Malone of TCI. The returns on TCI shows why Malone is a master in game. It also illustrate the economic moats of this game between cable tv, broad band and pay TV. For more resources of the industry do refer to this article over here. John Malone have been in the news often. He owns a stake in Direct TV, which is also owned by Berkshire Hathaway (who also owns Comcast). But Malone’s main vehicle have been Liberty Global ( LBTYA), which have been acquiring broadband telecom all over Europe. 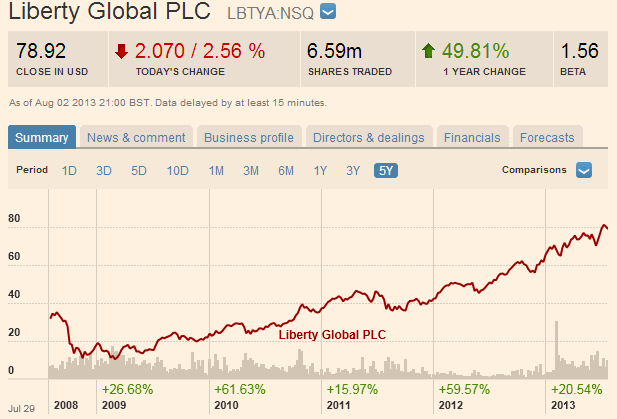 What many are betting is that Mr Malone will turn Liberty Global into the same monster as that of TCI. And true enough, the share price looks great. 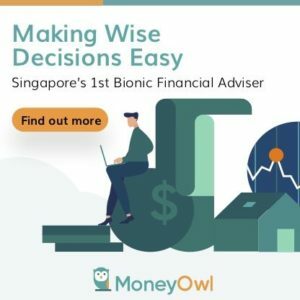 In Singapore, many dividend investors like the 3 telecom operators M1, Singtel and Starhub for their good and safe dividends. 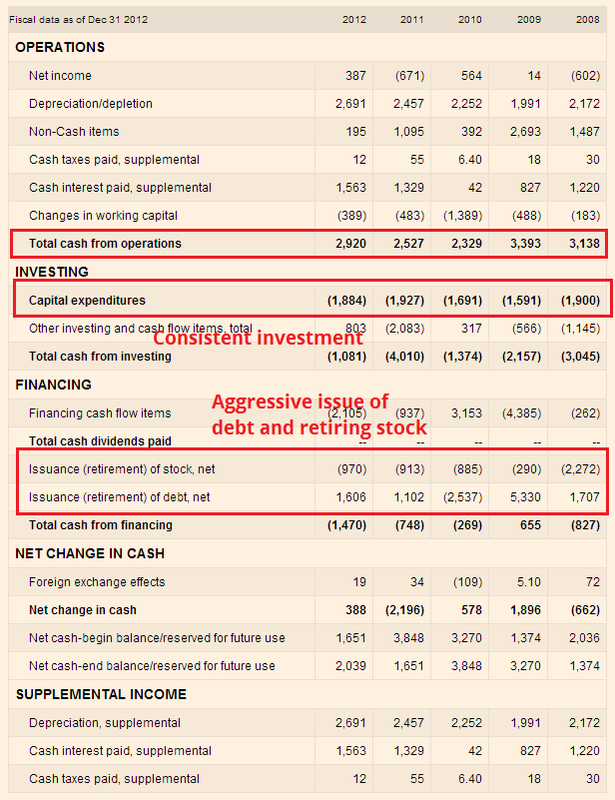 So how does the fundamental of Liberty Global look? If you have read my analysis of telecom stocks, you will see that Liberty Global is NOTHING like them. For one thing, it doesn’t pay out any dividends. Secondly, the income looks especially intermittent. You start wondering why you would put money into something like this. Here is a look at the balance sheet. 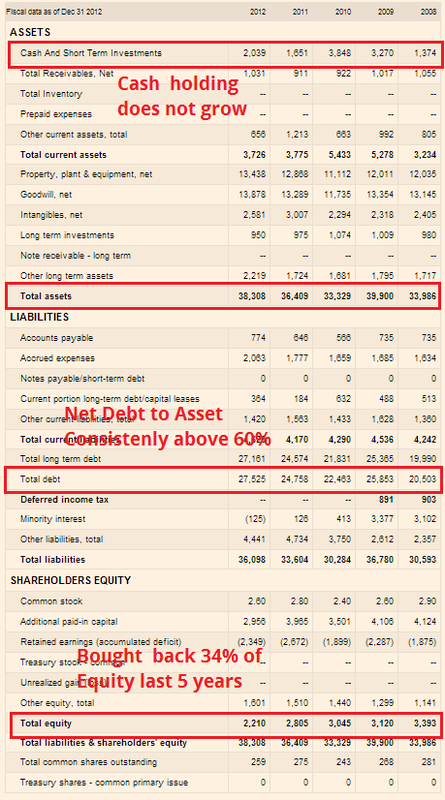 Net debt to asset is consistently above 60%. By now you would probably be so put off in buying this company. A closer examination shows that for the last 5 years there have been a huge shrink in equity. And that probably explains the share price movement. 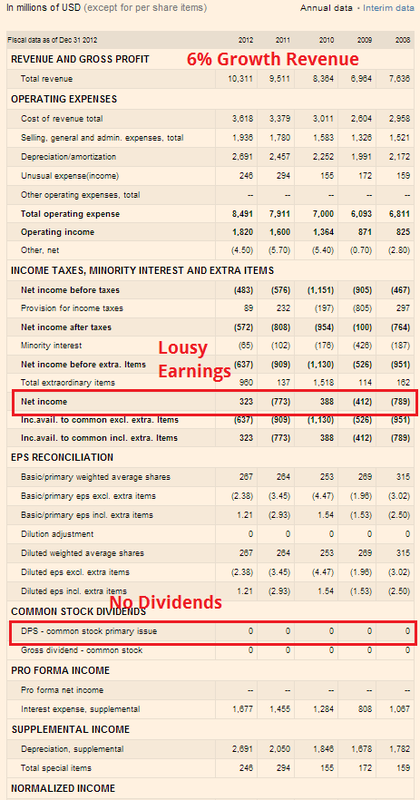 The financials look terrible, but that is perhaps the way the management wants it to be. With scale, they have the money to purchase vertically, that is, content that this mass of people will like. Remember that the tariff for these content would probably be able to share across a large number of subscribers and therefore cheaper than competitors. They can essentially bid a high price which their competitor couldn’t. Without broadband. And those have been embedded into modern lifestyle. This video is lengthy but well worth your time. Watch once, understand the intricate details of how they all add up together and you won’t have to keep looking up these information again. WIFI Enabled Power Meter – A great telecom disruptor? Smart Power Meters that are WIFI enabled may be able to bring budget cheap or free internet covering all of Singapore. This telecom disrupting is an interest area and its not something not plausible consider we have [email protected] in Singapore but the problem is that people tend to forget their passwords. I find it strange why would you need to set a password when the job is to offer to everyone. Are you trying to offset your telecom load or just to comply to the authority? I think it is more of the latter. Enter Silicon Valley Power (SVP). SVP is a non profit California based Municipal in the midst of implementing Smart Power Meters. These are meters that more or less i feel will eventually implement in Singapore. It tells you how much power you consume and relays back to the central power station but of course can be use to educate the public to use power in prudence. The opportunity is that it acts as a conduit to offer FREE UNENCRYPTED WIFI to the people. When advanced meters are installed at residences starting late this year, electricity and water usage information will be highly encrypted and sent via wireless network. Security on this part of the system mimics that of banking and national defense institutions. The technology will also spot outages quickly and help customers monitor their own electricity usage. The same SVP MeterConnect wireless equipment carries a separate channel for the free, public, and unencrypted outdoor Internet service. Users should be cautious while on any unencrypted Wi-Fi network. Outdoor access is best when unobstructed by trees or buildings and when using higher-powered laptops. The low power signal of smart phones and tablets could limit their Wi-Fi range. Granted, many locals are addicted to their home broadband. I cannot imagine them not signing up for something like that. But it is not cheap. If you do mainly news surfing and you already have a 3G-4G 2GB plan on your smartphone, having a 1MBps connection could greatly supplement that. Sure you cannot watch moves or have low latency in playing games, but for a group of folks this may be a godsend. 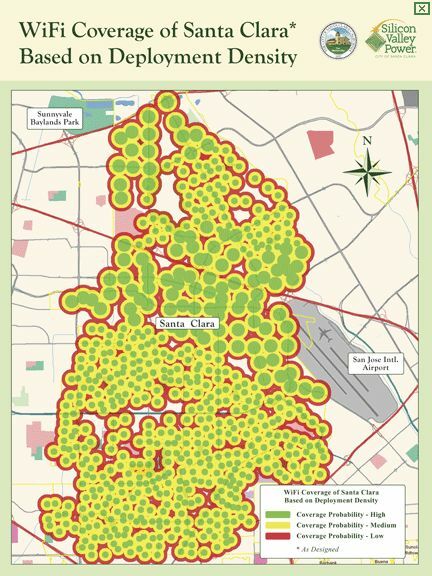 Now imagine a coverage such as this Santa Clara implementation. It will offload your 3G data connection as well. Gigaom have an article out talking about Google submitting to FCC for some of their upcoming wireless test plans. What’s interesting is that the switching cost now between surfing the web on your capped data plans in 3G or LTE and then switching over to free wifi hotspots are crumblesome. But what if its seamless. Google talks about setting up a hell lot of WIFI + Microcell towers and work together with their Fiber broad band to cover an area of 2 mile. You need a new protocol to easily switch from one data connection to another, or manage different data sources. If this is possible then it’s a boon to consumers. What can happen is incumbents can use this to bridge bandwidth bottlenecks. But it also presents an area where a new player can come in with a lot of WIFI + Microcell to offer a very cheap alternative. Look to FREE in france.